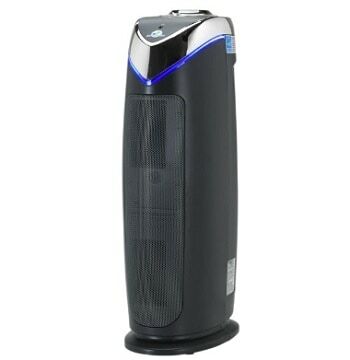 The Whirlpool 510 (AP51030K) Whispure true HEPA air purifier is made for rooms up to 500 square feet (46.5m). This unit is within $200 – $350 price range and has very good ratings. Let me show you is it worth your attention. Whirlpool 510 is quite big as room air purifier. It looks like a heater, not very stylish. But it is very smart design, the air inlet is in front, but the outlet is on top. So you can place it close to the wall, that allows you to save space. Also, Whirlpool 510 has built-in handles to transport the air purifier. Weight is 25lbs (11.3kg) which is ok for this size air purifier. Height 24in (61cm), width 20.5in (52cm), depth 10in (25.4cm). Whirlpool AP51030K have a fan which moves air through 3 filters. A fan is a weak part of this unit. Many customers had problems with noise coming from a fan. That is because the fan is not balanced. If you have one of them then you got a brack. Mine works very well. The Whirlpool 510 has a 3-stage filtration system. Pre-filter captures large particles and helps to extend HEPA filter life. Carbon filter eliminates odors. The carbon filter is too thick to eliminate high amount of odors, but with low ones get rid very well. In the middle is true HEPA filter and it filters 99.97% of particles that are 0.3 microns and larger. So with Whirlpool 510 filter system, you will eliminate dust mites, mold spores, pollen, tobacco smoke, pet dander, low odors and other microscopic irritants that can pollute your indoor air and aggravate allergy and asthma symptoms. This unit has electronic controls and 4 fan speeds. The buttons are plastic and look cheap, but I think you will not play with them very much. Turbo setting is good for fast cleaning. It is loud, though. The very good feature is sleep mode. When you push it, purifier switches automatically to low setting for 8 hours. After 8 hours, it goes back to the previous setting. It’s quiet in the-the low setting, annoyingly loud in the top one. I may suggest using medium setting during a day and low in a night. Use highest speeds only for specific circumstances. If used in recommended size room 500 square feet and let’s say ceiling height is 8 feet, then this air purifier get rid of smoke, dust, and pollen in just 10 minutes. Really amazing. Imagine how good it works in smaller rooms. Tha manufacturer recommends changing pre-filter every 3 months. I suggest vacuuming this filter every 2 weeks. That will save your money. Of course, they are not very expensive, 4-pack costs around $30. 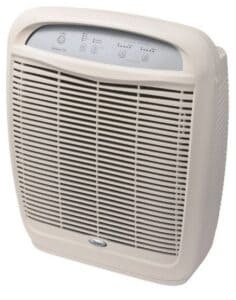 HEPA filter should be replaced once a year. Whirlpool 510 is energy star qualified. Really low energy consumption for that big unit. The Whirlpool 510 is true HEPA filter air purifier with one of the best value general air purifiers on the market. It covers 500 square feet space and costs between $200 – $350. Big size. Air outlet on the top compensates that a little bit because you can place it close to the wall. Posted in Air Purifier Reviews, Reviews and tagged Air Cleaner, Air Purifier, HEPA filter, True HEPA, Whirlpool 510 (AP51030K) Whispure.